The Hubby is starting to call Playing With My Food my 'soup blog,' so I guess it's time to post something not so liquidy (another new word!). Butternut squash is my new wonder vegetable (actually it's technically a fruit, but that's like saying that Pluto is not a planet or something. Details!) It can be mashed, pureed, roasted, served in a soup, and also used as a delicious base for a risotto. You can now buy it already peeled and pre-cut in a 2-pound package at Costco, or in a smaller packages at most grocery stores. Since Costco is my favourite store in the world, I bought it there. I first made the Butternut Squash and Cauliflower Winter Soup (yum!) that I posted last week, and then this risotto. In this dish, some of the butternut squash becomes part of the sauce and some will remain chunky. I added the arugula and parmesan topping at the end to add some zestiness, colour, and texture to the sweet creaminess of the butternut squash. By adding the arugula you could almost skip a side salad (question mark...I've never really been good at knowing how many vegetables a human being requires). Plus I just really love cheese, so there's that factor too. I've mentioned before that I love risotto, but I didn't realize how predictable I was until I looked to see what was posted on the blog at this exact time last year, and it was Tomato and Italian Sausage Risotto (still to this day my favourite risotto ever). If you're in a risotto mood, I also posted a Scallop and Broccolini Risotto recipe in the past. In a medium saucepan, combine the water and the chicken broth, and warm over medium heat. Bring just to a simmer, then reduce heat to low to keep warm. Place a large saute pan over medium heat and melt the 2 tablespoons of butter in the pan. 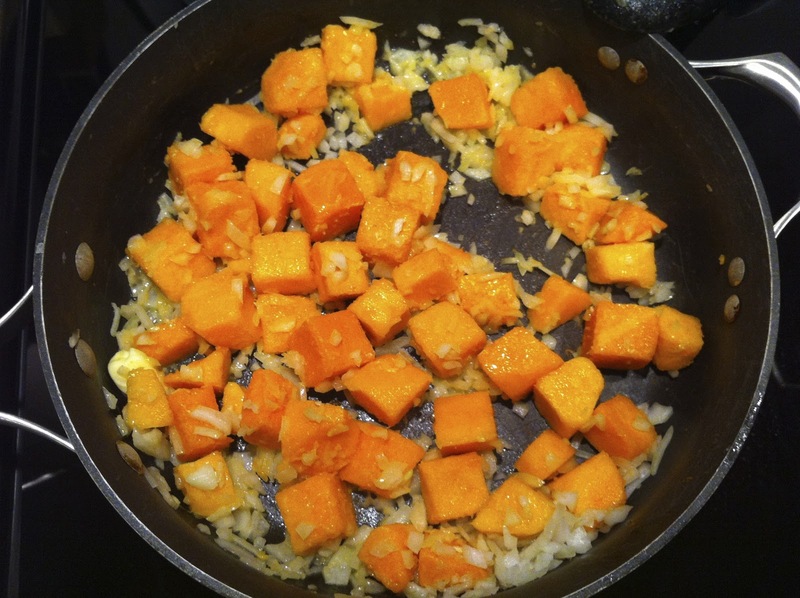 Add the onion and butternut squash, and saute for 5 minutes, or until onion has softened. Add the dry Arborio rice and cook for 1 minute, stirring constantly. Add the white wine and sage, and cook until the wine is absorbed, stirring constantly, about 1 minute. Take 1 cup of the broth/water mixture and pour into the rice mixture. Simmer over medium heat, stirring often, until liquid is absorbed, about 5 minutes. Continue adding the broth/water mixture to the rice mixture, 1 cup at a time, waiting for liquid to be absorbed (about 5 minutes per cup) before adding the next cup (and at the end the last 1/2 cup). Stir often during this process. After about 25 minutes, the rice should be creamy and tender (you may not have to use all of the liquid or you may need slightly more at the end, in which case add water). Remove the rice mixture from the heat, and stir in the remaining 1 tablespoon of butter and the 1/2 cup freshly grated parmesan cheese. Season with salt and pepper. Place into 4 bowls and top with the additional grated parmesan and arugula. Risotto will thicken as it cools. Serve immediately. Enjoy!